Hi new friend! Janel here from the sister team of NellieBellie. I’m the short, redhead to counteract my sister Lanet’s tall blondeness. We create healthy recipes, ridiculously decadent desserts, cozy drinks, cocktails, and pretty crafts & diy’s. You know, the important things in a Minnesota life . 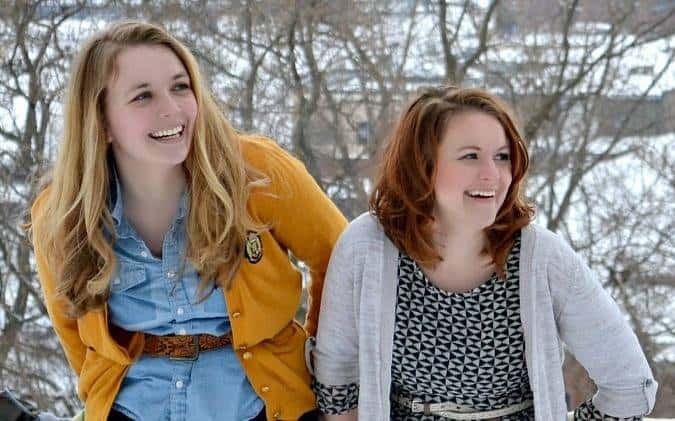 We’d love for you to pop by nelliebellie.com, our sister site thecampwhisperer.com, or our favorite social media these days … Instagram! These are not your child’s chocolate bars. No, they are not super sweet or rich or filling in the way that children love. Just a sweet, fresh, tasty, and grown-up treat wonderful for summer picnics and evenings. I serve these with a glass of lemonade (or wine, let’s be honest) in the summer and always get an “mmmm, that was nice” response. I realize that bloggers are often trying to give you the best AMAZING desserts or DELICIOUS treats with gorgeous photo’s and promises of the BEST thing you’ve ever eaten or the EASIEST treat you’ll ever made. “Mmmmm, that was nice” seems like a let-down for some. It’s not. Ever. Nobody wants to ride a roller coaster every day. But, a nice little jaunt on the carousel before bed could happen every night without complaint. These bars are a carousel. These are really, really good. You’ll like them. Alot. And probably make them again and again. 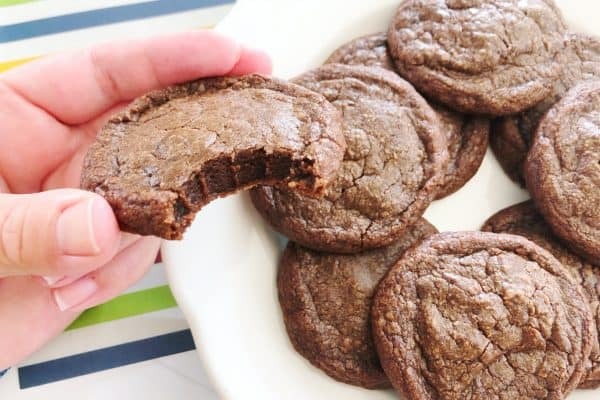 The dough for the bottom of the bars is the same dough for chocolate sandwich cookies. If you baked the dough and then cut the baked dough into circles you would have sandwich cookies. The kind of sandwich cookies to shove vanilla cream in between two. I use marshmallow in my bars, but this is optional. They add a gooey and sweet touch to the bars that I love. For some that have used my recipe, the texture isn’t something they like and they leave them out. Leaving the marshmallows out will give you a bar that tastes very similar to a Girl Scout Thin Mint. Really. But, will you give the marshmallows a try and see what you think? Really though, don’t ooey gooey roasted marshmallows and summer just make magic together? I think so. 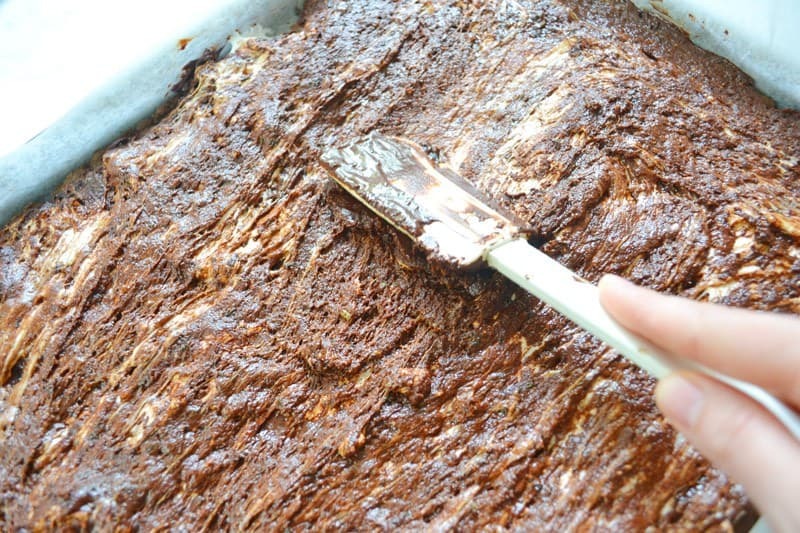 It’s a quick couple minutes to add the marshmallows to the top of the crust and broil them. Two minutes. Two minutes is worth the magic! The chocolate top of the bars couldn’t be simpler, fresher, or better tasting. 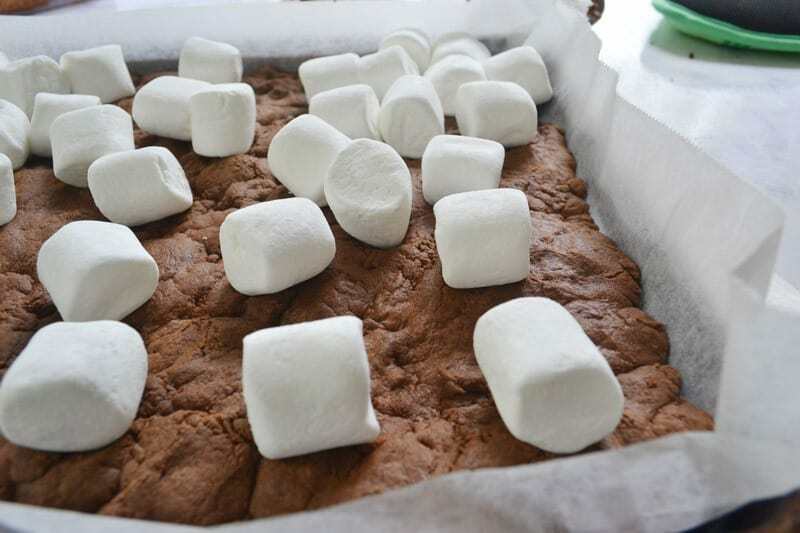 Use dark chocolate chips, fresh mint, and a small wad of butter melted together and poured over the marshmallows. Simple as that. Tip: I use fresh mint cut finely. You will notice the bits of mint in the bars but not be overwhelmed by large pieces of mint to chew. If you prefer, use a food processor to grind your mint small OR use peppermint flavoring instead of fresh mint (works just fine!). Do NOT use fresh mint that hasn’t been chopped well — gross! 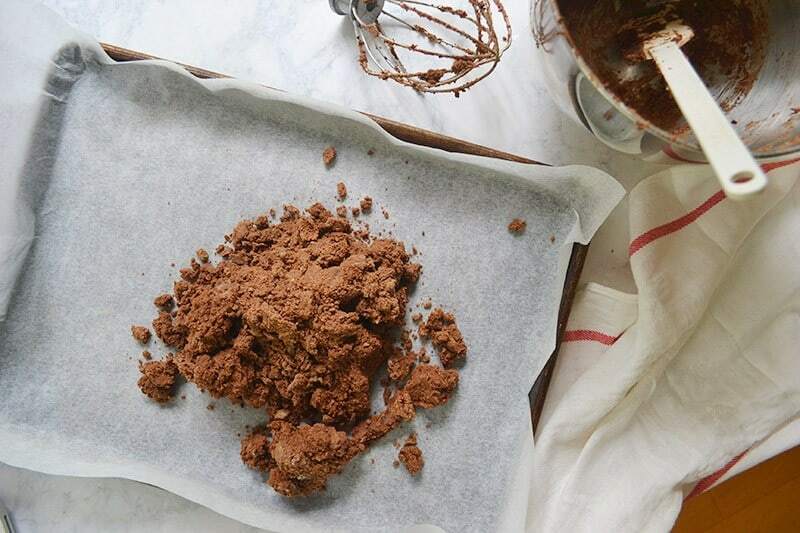 Tip: Use semi-sweet or milk chocolate chips if you prefer your bars a bit sweeter. Pour that hot chocolate mixture over the top of the bars and spread it into the marshmallows until the whole top is ooey, gooey, and messy. 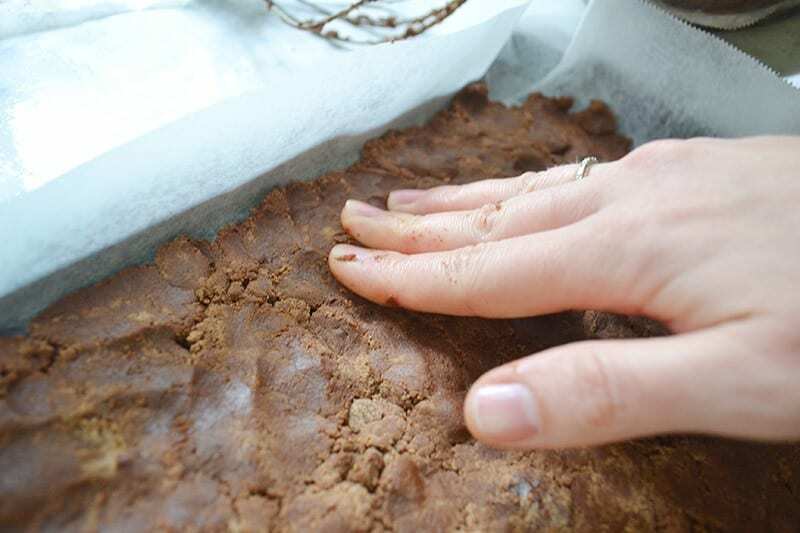 Tip: You’ll want to move quickly before the chocolate cools. There is NO wrong way to smoosh and spread marshmallows with chocolate! 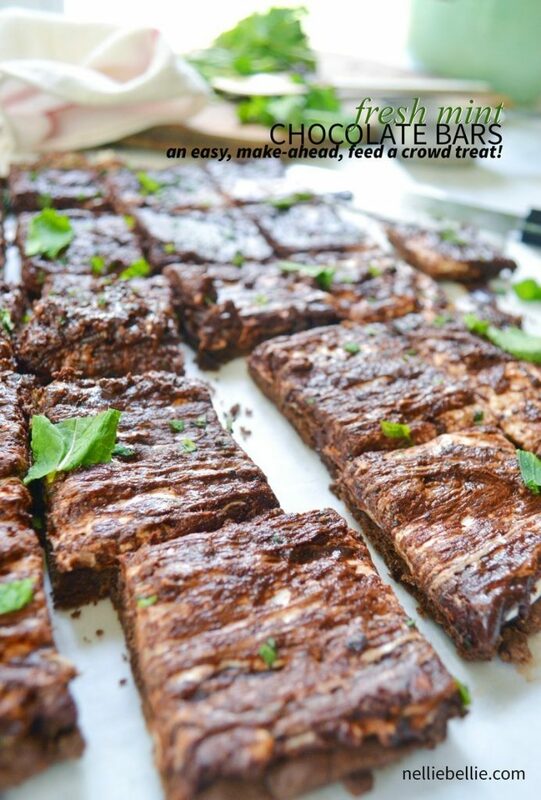 Top those bars with a bit more fresh mint and you are set for any gathering! Tip: Using fresh mint on the top clues people into the fact that there may be small bits of mint in the bars. They won’t be so surprised by the texture. If you choose to grind your mint very small or use flavoring you can skip this! Cream butter, cocoa, and sugars together in large mixing bowl. Add egg and melted chocolate. Mix well. Add flour and baking soda. Combine. Press dough into bottom of sprayed or lined cookie sheet. Bake for 7 minutes at 350 degrees. 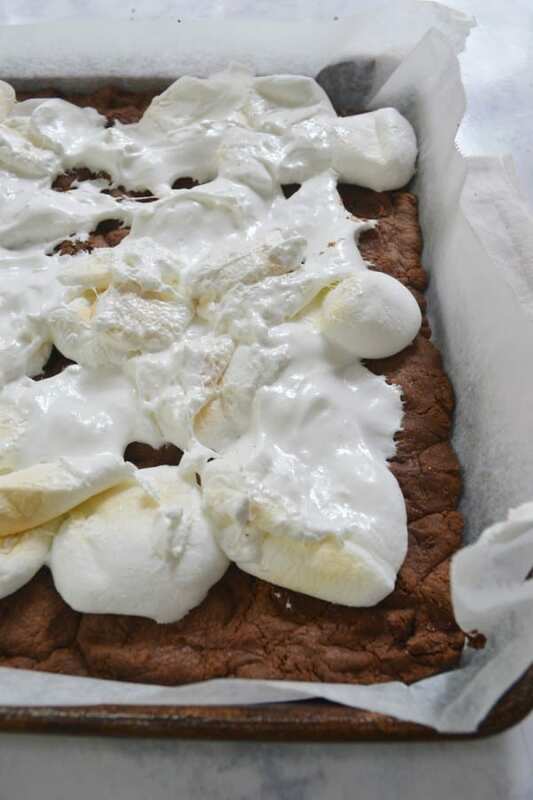 Place marshmallows randomly on the cookie base. Broil for 2 minutes. Press the marshmallows down with the back of a spoon or spatula. Cool. 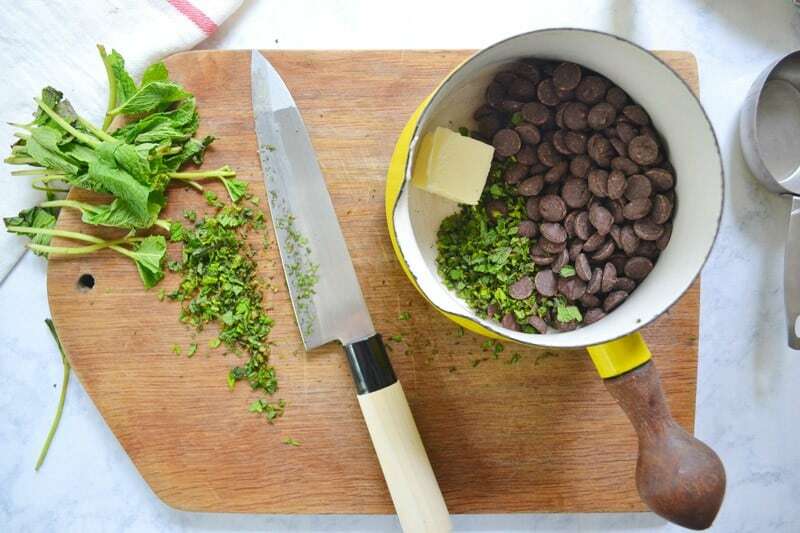 Melt the chocolate mint toppings together (dark chocolate chips, fresh mint, butter) and pour over the top of the broiled marshmall0ws. –I do this in a heavy saucepan on the oven but your microwave will work well, watch it closely. Working quickly, use a spatula to spread the chocolate and melt it into the marshmallows. Top with fresh mint, cool, and serve. I have lots of mint on the north side of the house.I will have recipe thanks for sharing. These look so yummy. Chocolate and marshmallows you can’t go wrong there. Thank for linking up this week on the #HomeMattersParty link up. Looking forward to seeing what you link up this next week. This looks divine! And that pot looks so cool with that handle. Thanks for sharing your recipe at Inspire Me Monday! Oh man do these look and sound GREAT!! I love mint and chocolate together! Oh those look delicious! I like the idea of using fresh mint, very smart! Those look delicious! I will have to make some soon! What a great idea. I would never have thought of adding real mint. VERY COOL. i want to make this now and see how it comes out. Thanks for sharing. This looks like a fantastic recipe. I will have to try it for my BBQ next weekend. Thanks for the great recipe. This looks so delicious. I will have to try making it this weekend. 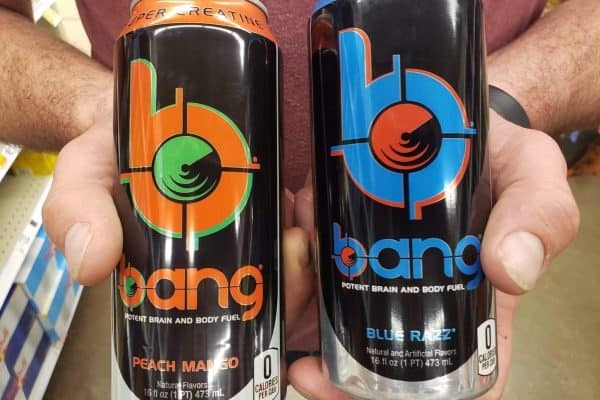 I am sure they will be a big hit. Those look so good. I will have to try it with mint. Are you kidding me?! Those look amazing. I love mint chocolate anything so these are right up my alley. Yum, yum! oh these look tasty. You can’t go wrong with chocolate and mint! wow, what a great idea to add fresh mint to baked goods. these looks amazing and refreshing. i just love mint! I’m in love! I have to make those this weekend. Thanks for sharing these awesome nom noms! Oh these look delicious! 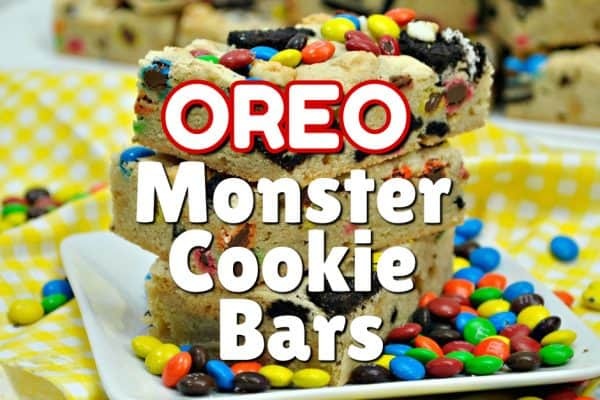 I want to try making them soon. OMG, Yes! There’s nothing better than chocolate and mint. Unless, of course, you add marshmallows. Yum! I can’t wait to try out this recipe. 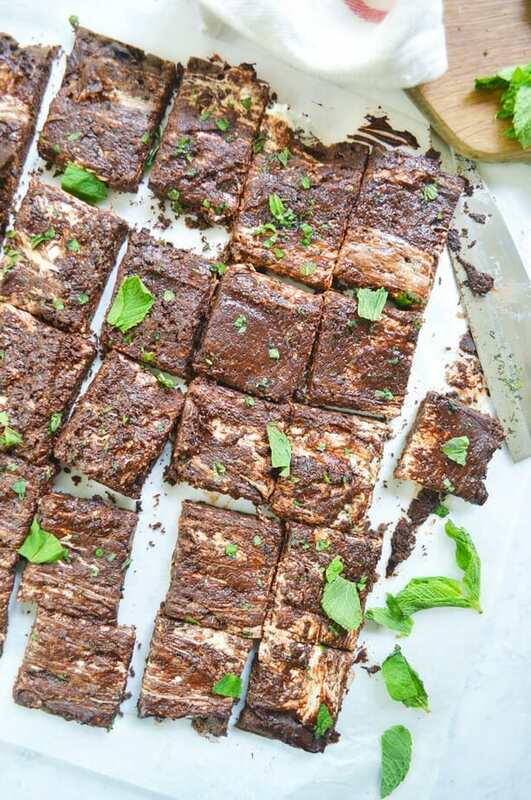 It’s the combination of some of my favorite ingredients; chocolate marshmallows, and mint. Yum!!! Those sound so good. My kids would love these. These look delicious. I like the idea of adding fresh mint. I have an apple mint plant. These sound delicious! I love the idea of using fresh mint instead of mint flavoring–I’ll have to try them sometime!